Floods in four districts of the eastern Indian state of West Bengal have claimed 19 lives and left over 250,000 homeless, officials say. Many villages have been cut-off in the worst affected districts of Birbhum, South 24-Parganas, West and East Midnapore, officials said. Relief workers were reaching food supplies to the affected villagers, authorities said. West Bengal had so far escaped major flooding during this year's monsoons. In East Midnapore district alone, seven people were washed away by the swollen rivers. The 19 confirmed dead were either drowned in the flood waters or died in house collapses, according to officials. "We are reaching essential supplies of food and medicine to them on a war footing but we have not been able to reach to all areas affected by floods," said the state's relief minister, Hafiz Alam Sairani. At least two rivers in the state's southern delta region of the Sunderbans were flowing well over their banks and officials say flood waters have spread to new areas. 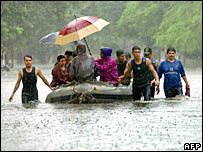 Unseasonal heavy rains over the last five days have caused havoc in the districts south of the state capital, Calcutta. More than 20,000 people have taken shelter in schools and government buildings after hundreds of mud houses were washed away in the more than 40 villages. Weather officials say the depression over the Bay of Bengal that has led to this spate of heavy rains will take some time to clear.